Public Health Minister, Dr. George Norton addressing a news conference on the controversial pharmaceutical bond. He had publicly apologised for unintentionally providing misleading information to the House. His fate rests with the House’s Privileges Committee to which the matter has been referred. President David Granger on Tuesday said he reshuffled the cabinet to address management problems at the Ministry of Public Health, improve inter-racial relations and address problems of the rural poor. In confirming the replacement of Minister George Norton at the Ministry of Public Health with Minister Volda Lawrence, Granger alluded the management problems in the health ministry. “Largely, it’s a management problem in terms of materials and human resources and the delivery of services to the various regions of Guyana and I believe she’ll be ideally suited to that ministry,” the President said in a video release. 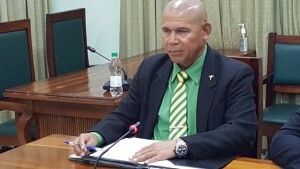 In terms of Norton, the President said he would remain a Cabinet minister and he is ideally suited for leading the charge in bridging the gap between the Indo and Afro-Guyanese populated coastland and the hinterland which is mainly inhabited by Amerindians. hinterland “I believe that he is ideally suited for that in the run up to local government elections and future developments, I feel that his contribution will be critical to helping to bring about social cohesion,” Granger said. 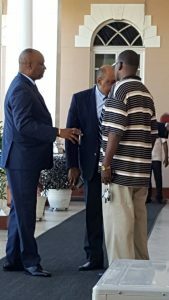 Retired Assistant Police Commissioner, Winston Cosbert (striped T-shirt) meeting with Minister of State, Joseph Harmon and Minister of Natural Resources, Raphael Trotman on December 20, 2016 at about 10:30 AM at Parliament Building. The movement of Norton from Public Health has followed a string of controversies in the health sector including the shortage of drugs in the outlying regions, under-utilization of the exorbitantly rented pharmaceutical bond from a member of the People’s National Congress Reform (PNCR)- the largest party in the governing coalition, the procurement of pharmaceutical supplies that led to a recent probe by former Assistant Commissioner of Police Winston Cosbert, and flawed instructions to the Guyana Food and Drug Department related to the release of food products that had been deemed unfit for the market. The Guyanese leader said the movement of Minister Amna Ally, a “very reliable person,” from Social Cohesion has come against the background about concerns about the quality of national unity and social cohesion. He said Ally, who is government’s Chief Whip in the National Assembly, would be responsible for improving the quality of life of the poor as Minister of Social Cohesion. “I believe that in terms of her knowledge, coming from Region Five from the rural areas, she has a good knowledge of the needs of the ordinary people in the urban areas, in the rural areas so I believe that in terms of Social Protection she will be able to bring skills in terms of her ability to interact with people, her knowledge of the problems affecting poor people and I am very confident that she will add to the work, supplement the work that had been done by Minister Volda Lawrence,” Granger said. Back in June, 2016 then Deputy Chief Mission at the American embassy in Guyana had said in a farewell address that Guyana social cohesion needed to go beyond talk. “Regardless of who sits in government, about half the population feels completely excluded. This has to change. And bringing ab0ut that change requires going beyond conferences and workshops on social cohesion,” Hunt had said. Preferring to call the ministerial changes a “shift” rather than a reshuffle, Granger hailed them as a “very positive move” to help improve the quality of the delivery of public service. He explained that he opted to change the ministerial portfolios in January, 2017 because several criticisms last year have detracted from Cabinet’s performance as a whole. Last year, the President had established a Ministry of Public Telecommunications and handed it to Cathy Hughes. In that change, spectrum management under the National Frequency Management was taken away from Prime Minister, Moses Nagamootoo and given the Hughes.He took away Tourism from her and gave that portfolio to Minister of Business, Dominic Gaskin. Minister Raphael Trotman’s governance portfolio was last year transferred to the Prime Minister and Trotman assigned to the Ministry of Natural Resources.